On a side note, the cup on Nora’s head made me smile through the tears. 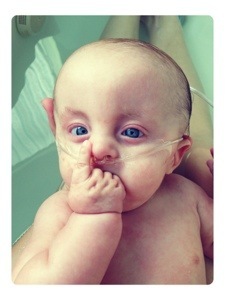 And, I must say, I love the little dimples in Nora’s hand. My heart aches for those children and their families. They are in my prayers. The news is in all the newspapers and tv channels here. 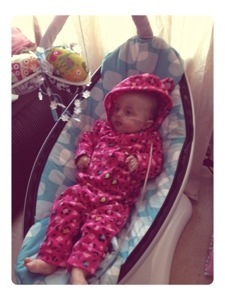 It seems Nornor is finally enjoying her Mamaroo!!. 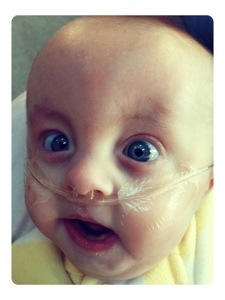 Happy baby, happy Mommy. THAT WAS A VERY SAD DAY FOR ALL. I ALSO CANNOT EVEN IMAGINE WHAT THE LOVE ONES ARE GOING THROUGH. ALL I KNOW TO DO IS TO ASK GOD TO BE WITH THE LOVE ONES AND GIVE THEM STRENGTH TO GO ON. THAT WAS SUCH A NEEDLESS ACT. I AM GOING TO JUST KEEP PRAYING FOR ALL THE LOVE ONES, THAT IS ALL I KNOW TO DO. I JUST CAN’T UNDERSTAND THE WORLD THAT WE LIVE IN ANYMORE. 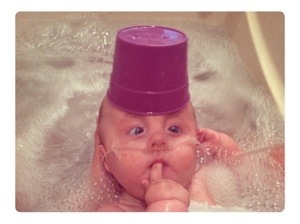 I ALSO LOVE THE PICTURE OF LITTLE NORA WITH THE CUP ON HER HEAD. SHE IS SOOOOO BEAUTIFUL. 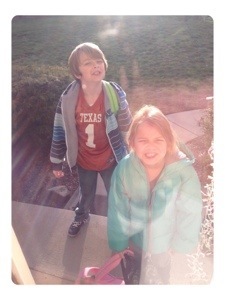 LOVE THE BIG SMILES ON THE BIG KIDS, AND I AM SO GLAD THEY HAD THE HAPPY FACES WHEN THEY GOT HOME. LOVE YOU ALL.